On June 17th, every year, the family goes through a private ritual: we photograph ourselves to stop, for a fleeting moment, the arrow of time passing by. What a fantastic project. I have one client that comes in to the studio every Nov for a father daughter portrait, its a shame more people don't do more of this. Sebastian is hot. Just throwing that out there. I love these photos! They are fantastic and a great idea. It is so interesting to see how the boys facial features change and how much more they look alike as they grew. What a great idea to include with a family genealogy. Vcs estão MUITO BEM! Parabéns! Fazia tempo q não os via, mas hoje os achei, sem querer. Lembro q escrevi à vcs há mt tempo, lá por 1.800 e bolinhas, sei lá... E é claro q quiz fazer o mesmo. Mas, como tudo, só penso e não faço nada! C'est la vie! Espero q estejam juntos, com saúde e conquistando vitórias. I have been following this website and family for several years now, and I always enjoy coming back to see the latest photos, because I love this idea of following the family chronologically. With that said, I was disturbed to see the tactless and tasteless comments made by individuals who are clearly bored and have no sense of decency or respect. Shame on you for being a cyberbully. You should be embarrassed for your comments and for the disrespect you have shown this family who were kind enough to share a piece of their lives with the rest of the world. I want to express my thanks and gratitude to this family for sharing this website and for their generosity. I look forward to future viewings. This is an amazing idea of a site -Glad i stumbled upon it by accident.. simply wonderful. |2013-06-21 02:03:34 Minas - Hi! I'm glad you are all OK! Antonia has grown up! Beautiful families! Un trabajo impresionante. Te felicito. |2013-06-18 10:31:28 TL - 2013? It's June 18 and still no 2013 photos? this is awesome to the nth level! I'm so glad to have come across this before our daughter was born, thank you! This website allows you to easily create your own beautiful gallery for your family. Please have a look and see if it is something for you. I have been checking in on this site for several years now and am delighted to see that the family has started with a new generation! Amazing work! excellent! i only wish you were smiling a bit! I wonder why we want to make sure that people look happy whenever they're in front of a camera. What if they're not in the mood at that very moment? If someone is sad, should they delay the photo session or just fake the smile? Would we know what they look like normally? |2013-01-02 15:45:26 Vasilis - 1976- age? Nice job. How old were you on 1976? I believe Diego was 29. However i don't have words to describe the feelings when i saw this span that is really cool and appreciable! Thanks for sharing! Felicidades amigo, nunca vi mejor manera de CONSERVAR el tiempo. Uau! Muy lindo este proyecto. La constancia del respectar cada 17 de junio todos juntos y de no tener miedo del tiempo que inexorablemente pasa. Hi, I have been following Diego and his family for years and I have always wanted to make my own gallery but never got around to doing it. I have just found a website that makes it extremely easy and fun to create your very own gallery like Diego. In case you're interested, have a look at link:www.familygallery.com. Diego, I hope you and your family continue to do this for many more years, really loving your work. Sorry, but clicking on the link in my previous post does not seem to work. Tras mucho tiempo, me alegra volver a encontrar sus retratos... y ver que la familia crece. Sigan bien, un fuerte abrazo desde Viveiro en la costa gallega. |2012-09-03 23:44:32 Diego Goldberg - No soy yo ! |2012-09-03 23:43:39 Diego Goldberg - No soy yo ! Es un homónimo. Nada que ver conmigo. it's amazing to see such dedication and discipline that didn't only stop at the parents, but also went on in their kids and grandkids. |2012-08-29 10:53:49 Gustavo - Parabéns! Parabéns, idéia simples e brilhante, que Deus abençoe sua família. I've been looking for this for a while now. This was it! Thank you! I freaking love this. |2012-08-18 08:52:31 Luis Luque - Qué documento ! Como dijo un gringo antes que yo, qué hermosa y simple idea para dar una respuesta a los que se pregunten qué es el tiempo. 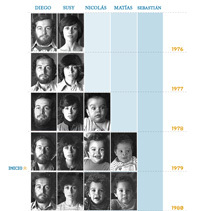 de 1976 a 2012 o pai dos 3 filhos só mudou o cabelo o cara é imortal!! |2012-07-27 15:26:12 Christian - wiseclown - Chapeau!! Thanks you for sharing your life moments with all of us.You put it best..for a fleeting moment you stop that arrow in time. I wish you the best in the future, and in this lovely tradition. Fabulosa coleccion de imagenes. Espero que continue el proyecto. Creo que me he enamorado del hijo menor. Fantastic representation of time passing. So funny to see the changes.I have also photographed my daughter every year for the past 18 years beginning when she was 3 months old, with the same background and as close to the same lighting as possible.Good thing I went with a large background initially. Looks like I'll have another 17 years to go to get to your 35 years of recording. |2012-06-21 13:56:31 David Arriaga - Would love to see it? Have you published them on a web site, Patricia? I'm sure I'm not the only one who'd love to see your time registry!!! Пиздец, я один тут русский! |2012-06-01 05:41:00 ml - We're waiting!!!! I'd really like to congratulate the family for this beautiful and simple way to show how it's nice to record every moment of our family, and doing so through the years, is a wonderful thing to see ... I loved the way you found to assemble the family tree, you are to be congratulated! I loved this & wished I had done this down through the years. Wherever you go there once was a forest. Plant & protect Danny's trees for life. Trees are the lungs of the earth. |2012-05-24 09:40:28 Jack - Sebastian! Sebastian is so hot! I hope you finds himself a beautiful boyfriend. It's a wonderful idea, to share such passion with their family! If I'll find the "right girl", I share my photo with her. For now I have only 29 years pictures, taken every 30th december, at the same studio. Last year, I asked a friend to came with me, to shot this short video. |2012-05-20 23:46:28 Alejandro - Que bien! I cannot wait to see this year's photographs. It's every June, right? This is increible and eery at the same time, for me. Fantastic! Cool, they take their pictures the day after my birthday. Muito interessante. A nossa marca segue. Thank you for sharing your images with us. What a beautiful set of images of such beautiful people. I wish you and your family all my best in health and happiness. Thanks for the unique photo history. Very interesting! It is a living time capsule. There's something a tad disturbing in the family never changing their expression in these photos; hope they are happier than these photos suggest! One of the things about looking at a family photo book is getting to see our expressions change, our smiles, our pranks, the full range of emotion we can show - without seeing that here, I feel something about the photographs is incomplete. But that's just a personal impression - this is certainly a fascinating project. A little scary to realize the power of time over us..
That is really awesome! We are constantly changing and as so we can't see it. So this couple has made a great thing! One moment that I like most is that these people were shot in the same position and surrounding each time which makes the changes occured in their appearacnce even more noticeble. everybody should take this experience like an adventure of life ! |2012-01-06 17:45:52 Luiz Cláudio - Maravilhoso! Acompanho o site há muito tempo e sempre me encanto com as novidades! Um abraço a toda essa bela família. Thank you for your families pictures taken throughout the many years. The consistency of your efforts is truly amazing! wow. simple yet priceless. thank you for sharing. i wish you all the best in your future. Interesting to see that in 2011 all 3 boyz looking just like their father. |2011-11-29 18:34:56 Lee Harless - Interesting study, into facial aging over time. Neat look into the aging of your faces, over time. Thanks for this. Has there been any interest, from scientists? Dad is wearing the same shirt in 82, 86, and 89. How absolutely wonderful; wish I had thought of this when my kids were little. Thank you! This work represents a true demonstration of a strong will power. Congratulations Mr Diego and family. i come back to check on this every now and then too. fascinating watching the changes and comparing how much you all look like each other haha i don't know why but i just enjoy doing that. and really really happy the line continues! |2011-08-30 09:03:09 Jim Garland - Spectacular! I love that your family is still doing this exercise. I have not visited for several years, and I love how a new generation is now starting up! I look forward to following this for many more years. Thank you for sharing. This is a wonderful and thoughtful idea and thank you for sharing your journeys with everyone. The arrow of time does indeed keep flying but in the end it gives us our direction. Whether that will be up or down God only knows. Mano muitooo showw!!! isso é arte viva 100%!! É maravilhoso isso!! Vou também criar algo assim com minha esposa!! Parabéns!! This is a beautiful thing, truly. Very inspiring to the point where I'd like to do the same for my future family. Thank you for this - You have a very handsome family. I wish you and your family many more wonderful years to come. Very interessting, please dont stop. I think physical change of human face like a fruit life process. Hello. I'm very impressed with a family that not only spends time together, but has documented it over the years. I first found out about you many years ago and bookmarked your site. I try to remember every June to visit again. I actually came back again this year for some odd reason to find the new addition. Love it! Thanks for sharing such a lovely family tradition. Very inspiring. watching this family grow into the people they are today have been a truly unique experience. Lovely and simple idea, I wish you all the best in the future.
. But at the same time, it acts only with sexual arousal. Viagra has a number of advantages in comparison with injections in the sexual organ or other procedures aimed at treatment of impotency.